This subtle ring boasts a unique crossover design, featuring a 1/5ct diamond set cross intertwined with polished sterling silver. Stylish and sophisticated, this ring makes for a beautiful eternity or cocktail ring. Elegant silver jewellery for all occasions. 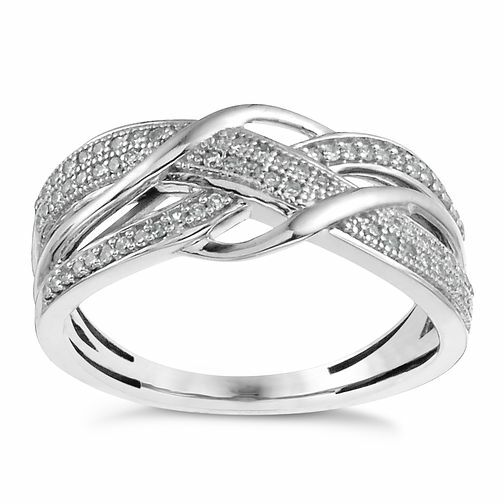 Sterling silver 1/5ct diamond crossover ring is rated 5.0 out of 5 by 1. Rated 5 out of 5 by Anonymous from Lovely sparkle Lovely ring looks so nice on. Highly recommended shines in the light. Also looks bigger than in the picture, delighted with it.